Greetings from vacation at the Jersey Shore! While I absolutely love cooking- even while on vacation- I know some people are either too busy with outings or simply not in the mood to plan an extensive meal while in paradise. And so, I present you with a simple recipe that can please a crowd without a lot of work on your part! Heat oil in a deep skillet (that comes with a lid) and add the garlic and onions. Sauté over medium-high heat for 10 minutes, add in fennel seeds and basil, and cook for 1 more minute. Stir in the chopped cabbage, tomato sauce, and salt and pepper and let cook for 10- during this time, the cabbage will shrink down and become saturated in tomato sauce. With the back of a spatula, pat down the cabbage to create a flat surface. Crack one of the eggs into a bowl and then gently slide on top of cabbage. Repeat with the remaining eggs. Cover skillet with lid and let eggs cook through (this takes me about 15 minutes). Top with extra basil and serve. Bacon might as well be a museum artifact in my house. Why? My dad has a very strict “you can look, but not touch” policy towards the stuff. Consequently, we have a lot of “untouchable” bacon buried in our freezer. Which is why, when my dad leaves town for a few days, I sneak a pack down from the freezer to add to meals and whatnot. Shhhhhhhh! But hey- I don’t feel guilty because I know he makes some for himself when my brother and I are out of town. Anyways, I had to dispose all of my contraband before my dad returned, and this was an effective and yummy way to use some up! In a skillet, cook the bacon until crispy. Transfer to a paper towel-lined plate and blot off the extra fat on the bacon. Set aside. Without removing any of the liquid fat, add the onion to the skillet. Let cook over medium-low heat for 10 minutes, stirring every so often. While the onions are cooking, crumble your bacon into small pieces. Once the onions have had their 10 minutes, remove with a slotted spoon, place in a bowl, and set aside. Add the cabbage to the bacon skillet (depending on the bacon you use, you may need to add extra fat at this point- I didn’t need to though) and cover with a lid for 5 minutes. Afterwards, take off the lid, add salt and pepper, and sauté for another 5 minutes, until the cabbage has shrunken down sightly. Add the onions and bacon back into the skillet and mix around for another 2 minutes, adding salt and pepper to taste. 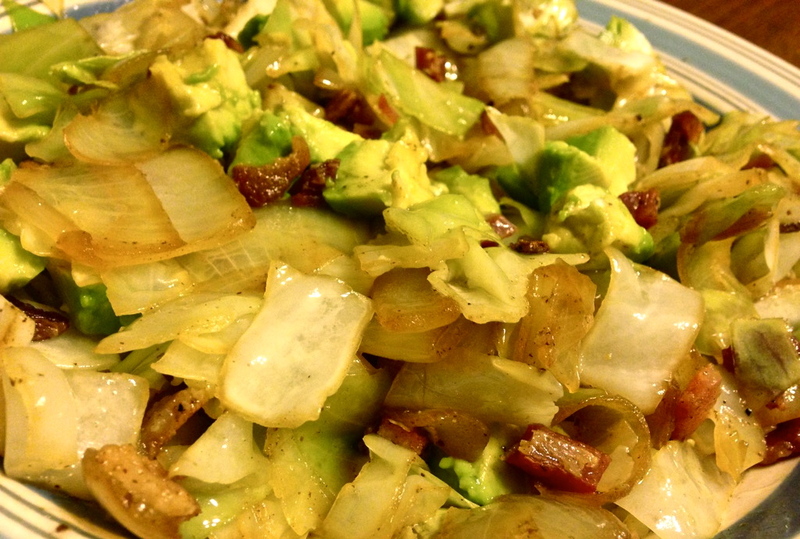 Transfer contents to a serving platter and gently stir in the avocado chunks. Serve.